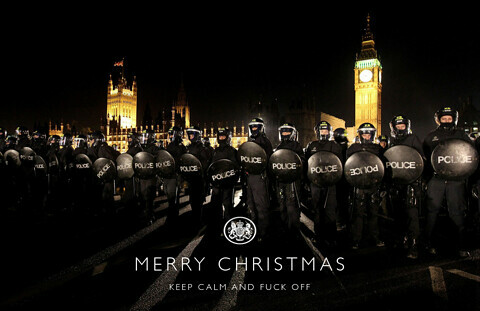 To go alongside my festive Metropolitan Policeman's Christmas Card from last year I thought I would print this lovely picture that I just saw on Google+. Obviously photo's like this do nothing to help the already stained image of our police force. An unarmed woman is being chased by a Robocop suited angry cop waving his baton in a striking motion. I am sure the woman has just asked this friendly cop where the nearest public toilets were or if he could help her find her lost puppy. It had to be something horrible like that to cause such a violent response in the cop. Personally I just cannot think of anything that would have enraged this cop so much that he would try to attack her in such a way that could permanently damage her depending on if and where the baton struck her. Those extendable metal truncheons hurt you a lot if you get hit by them. If you get hit round the head you could possibly die from the blow as many people have. Ian Tomlinson an innocent bystander in the 2009 G20 protests in London was hit around the legs by a cop with such a truncheon and he shortly died afterwards from a heart attack. The inquest into his death found that he had been unlawfully killed. The policeman who had hit him Simon Harwood was charged with manslaughter and was dismissed by the Metropolitan Police for gross misconduct. The Metropolitan Police settled a civil action by Tomlinson's family by issuing a formal apology for its "use of excessive and unlawful force" against Tomlinson, and agreed to pay an undisclosed sum in compensation. I have to ask what possible act could this lady have done to enrage a policeman so much that he thought it was necessary to chase and attack her with an extendable metal truncheon? It's probably standard operating procedures for our now police state enforcers. Dare to defy the overlords and face the consequences serfs! This is the photo the police were sending round to each other as "a joke" which obviously got released to the public so that we could see the funny sense of humour our policemen have. Serve and Protect or Beat and Bet Corrupt? View the original Our Police Serving and Protecting article at www.darkpolitricks.com.